ISLANDERS of all ages were able to enjoy games, hobbies and amusements from history at this year’s HistoryFest. The annual weekend event at Castle Cornet was themed ‘past times’. ‘We have different games and activities that people used to play through history scattered around the castle and amongst the displays,’ access and learning manager Jo Dowding said. Members of the Guernsey Military History Company showcased the ‘downtime’ of garrison life in the castle, revealing a different side to those involved who were more known for their work in action. For the first time at HistoryFest, there were displays relating to the life of Victorian soldiers, as well as First and Second World War servicemen and women. Queen Victoria also made an appearance and was speaking to the children about what it would mean to be a child under her reign. 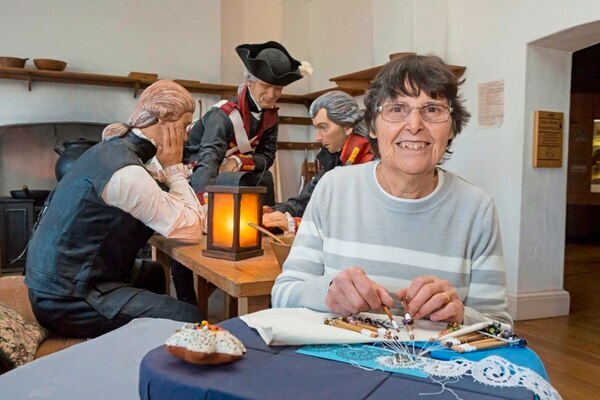 Visitors could also learn to bobbin lace, learn about the history of fortune telling, make beehives, learn historical board games and have their face painted. There were also showcases of live music and dancing with a ‘vintage’ or ‘traditional’ theme. Enjoying some of the home-made games in the castle were Aria and Arwen Furness. Their mum said they were really enjoying the day and it was a great way for the girls to learn a bit of local history as well. ‘I liked the noon-day gun and I like playing these games more than the toys I have at home,’ five-year-old Aria said. The theme was inspired by the current Timewarp of Baker’s Bazaar toy shop at the Guernsey museum. ‘It is what gave us the idea to focus on toys this year,’ Ms Dowding said.